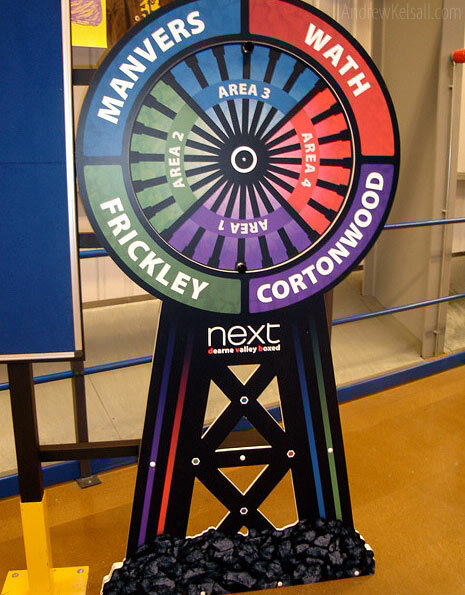 I was approached by Mr R. Moody, ASM for the Dearne Valley Boxed Distribution Warehouse near where I live in West Yorkshire, to design a custom ‘pit-wheel’ for the inside top floor. This building is part of a 100m pound investment by Next, plc (which also comprises of the well-known Next Directory). 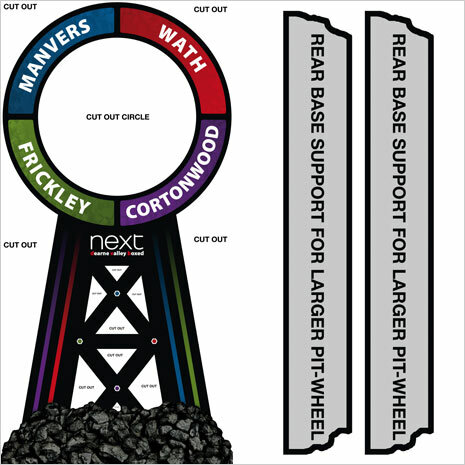 Richard wanted me to design a large, two metre-high structure that was based on a Pit-Wheel design. My last article about the Pit Stop logo (which was also done for Next) explains the relevance of this symbol. I was also tasked to design a smaller version as well, but this article focus’s on the larger one I made. 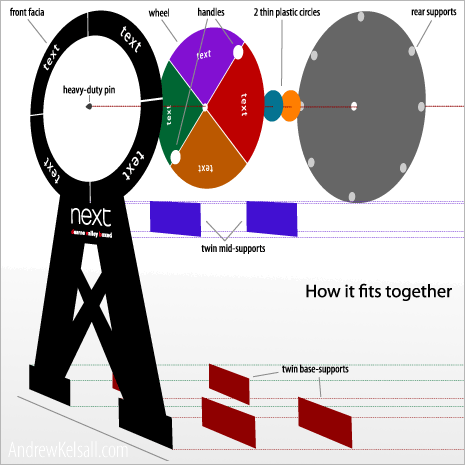 Throughout this article, I will explain what exactly this ‘Pit Wheel’ is, what it is for and how I designed and constructed it. 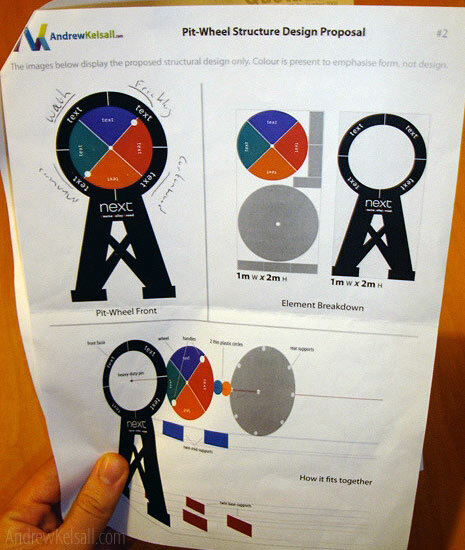 The image above shows my original design proposal after I presented it to Richard on our first meeting. The first thing you may notice is how this project wasn’t a standard graphic design job. The task I was presented with was a challenge in itself — and bordered more on industrial design…but I do like custom work and enjoy a challenge. I suggested that the design should be printed onto 10mm Foamex. This is a very strong material that is a cross between foam and plastic, and ideal material for large-format displays and custom work. The image above shows a sample of the 10mm white Foamex used. This sample is one of the pieces I used to construct the upper section of the pit-wheel, explained later on in this article. As can be seen in the above illustration, the Pit Wheel was to be comprised of three layers of 10mm Foamex. The round colored section was to be a wheel that would spin left or right. It was to be ‘housed’ in between two layers of Foamex to protect it from fraying after prolonged use. 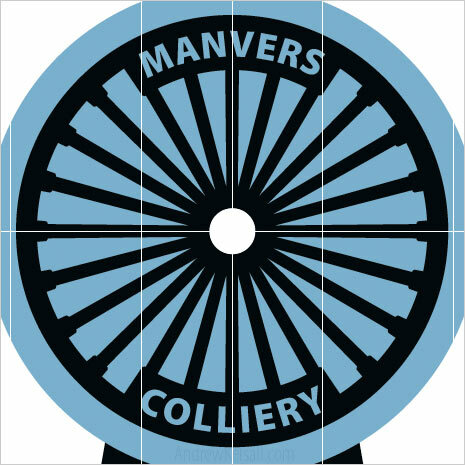 As previously mentioned, I recently designed a logo for the same Next warehouse based on a pit-wheel design, with the words ‘Manvers Colliery’ included as part of it. I used the same vector image in this design, excluding these words. 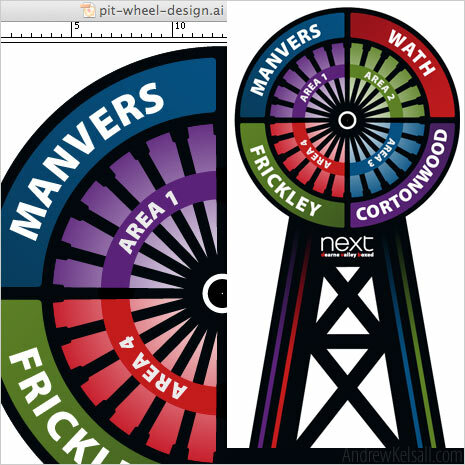 As can be seen in the design above, I got to work designing the look of the pit-wheel. Richard wanted it to be functional and very clear. Well, a great way to convey clarity is with both form and colour, so I designed the wheel with four colours that were very bright, in four clearly-marked sections. …And, oh, I think I’ve reached a point in this article where I better explain what this design is for. 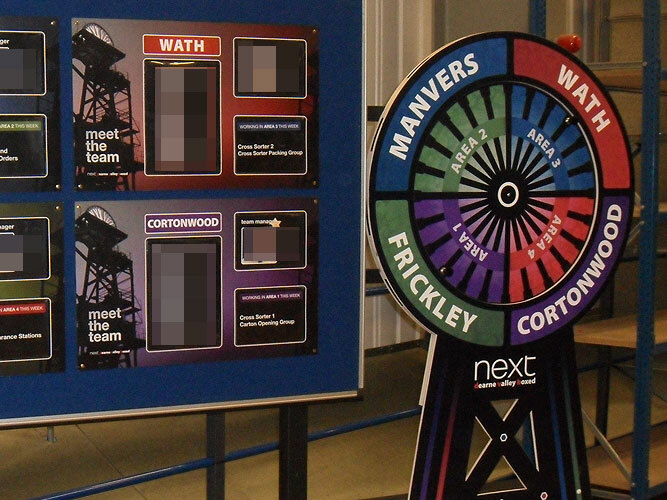 Staff who work at Dearne Valley Boxed (or DVB) are separated into four teams: Manvers, Wath, Frickley and Cortonwood. These are named after surrounding towns that once had Coal Mines. 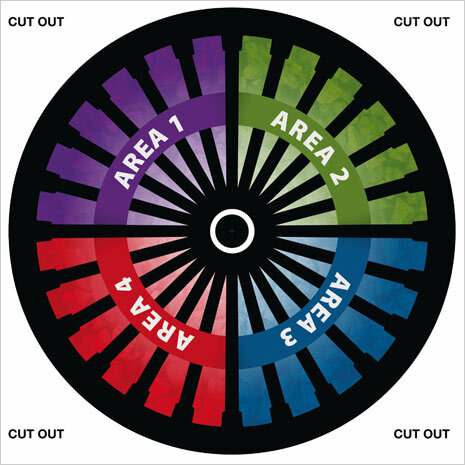 There are also fours areas that staff can work in (numbered 1-4), so the idea of this wheel is that every week, the wheel is turned, communicating to staff which area they will be working in — genius don’t you think? For any of you who are either just interested or familiar with vectors, I have included a snippet of the wire-frame created in Adobe Illustrator (above). As can be seen, I experimented along the way to create a design that did its job properly — to effectively communicate to staff. 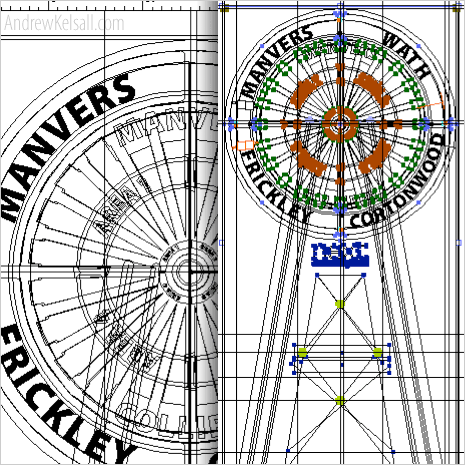 This is a closeup of the detail of the pit-wheel design. After importing the vector imagery into Photoshop, I layered-in some coal imagery for added affect. 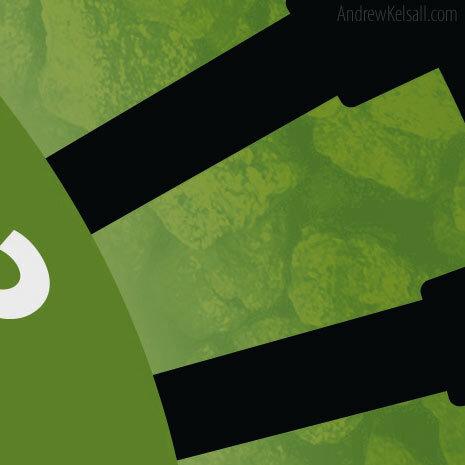 The green section displayed above shows how the coal fades into the green in a subtle manner. When all the designs were complete and approved by the client, I set about preparing the artwork for print. This was quite a labourious task, as I had to separate the varied components into different files, name the files and mark where they needed to be trimmed by the printer. Another consideration was the actual file setup. Obviously, I needed to convert the RGB imagery into CMYK, but I also needed to ensure all files were 400dpi at exactly one-quarter print size. If I were to get any dimensions wrong, the whole design wouldn’t work or fit together. I also typed an extensive ‘Printers’ Note’ explaining further the exact final dimensions and where the cuts should be made. The image above shows the final composition of the pit-wheel (on the left) and an example of two of the back supports on the right (not at scale/ratio to each other). These were printed on separate boards of Foamex — which were arranged for maximum cost effectiveness for the client, Richard Moody at Next DVB. Finally, once the designs were printed, I constructed the two metre-high unit using 3M SprayMount and brass screws. Foamex has the density of a soft wood, so screws can hold these Foamex boards together quite well. I attached handles made of Aluminium and Acrylic to the wheel so it could easily be rotated. After constructing the pit-wheel, I liaised with a local construction firm on-site, who constructed a black wooden frame, as Next wanted the structure to be free-standing next to a notice board (shown above). Overall, I was pleased with the results, with everything going to plan. The Foamex shapes were the correct size, the print-work came out great — and the client was impressed. Do you like this large-format design? Have you done anything similar? If you have completed a job like this, what did you do? If you would like me to work on a custom project like this for you, please contact me or use my Hire Me online form. If the project requires constructing, like this example, I’m a very ‘hands-on’ designer and can give you a quotation inclusive of this. Generally, I will travel up to 50 miles away from the Leeds area, but costing for longer distances is not ruled out. Would love to do more large format print work – looks good, Andrew. Cheers Richard. I’ve been doing quite a lot of large format print lately, although the file sizes often bring my Mac to it’s knees…need more memory! Yeah. unlike with Logo design, when [as a designer] you undertake custom work, you’re not in competition with every designer on the net. I love to do custom work like this, as I love a great challenge. I’ve been doing some other large format prints of late, so I’ll probably pick one out to blog about at a later date. Very interesting post. I used to love using foamex for presenting ages ago. And a great idea for a display unit. Very important that you put that coal texture over the gradients – it completely makes the job for me. Textures are so important and I don’t use them enough leaving the flat colors and gradients bare and unexciting. .-= Rob Cubbon´s last blog ..Cloud commuting and graphic designers =-. Foamex is great to work with, I had to do a 2.4 meter high shrek for an expo. You finished result looks good. ← Avoid Bad Design with White Paint?